It’s been a long two months since the winter finale dropped shocker after shocker, but the midseason premiere of Grey’s Anatomy was worth the wait. The last time we saw our favorite TV docs, every storyline was on a tipping point with no clear ending in sight due to the hospital’s mainframe being hacked. Meredith and intern Schmitt — a.k.a. “Glasses” — were stuck in an operating room without access to the blood bank as their patient was bleeding out on the table. Jackson and Maggie were stuck in a medivac, covered in their patient’s blood after a tube from his ECMO machine came loose. Alex and Amelia didn’t know which medication to give their young patient and were awaiting the word from Jo, who got stopped by a surprise visit from her soon-to-be ex-husband, Paul Stadler. The biggest cliffhanger was the arrival of Paul. Grey’s Anatomy has been setting up the inevitable reunion of Jo (whose real name is Brooke Stadler) and her abusive ex (played by the talented Matthew Morrison), and it certainly didn’t disappoint. Jo is rightfully taken aback and shaken by Paul’s sudden appearance with his fiancée, Jenny. 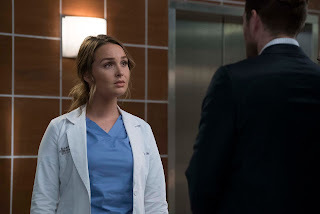 After a brief moment of confusion and hysteria, Jo tries to get away from the situation only to be stopped by Arizona and Richard gawking over Paul’s visit to the hospital. To be fair, neither knew about Jo’s past with Paul prior to the events of this episode. As Jo tries to run away and hide, Paul decides to help out around the hospital before getting Jo to sign the divorce papers. He winds up in the operating room with Meredith, who knows exactly who this mystery man is when he says his name. Meredith’s immediate disapproval and harshness towards Paul was like a mama bear protecting her cub. Alex becomes just as protective as Meredith when he learns that the man he would like to kill is running around the hospital. Paul is a pretty good manipulator, which gets showcased several times over the course of the episode. First, he tries to lie to Meredith about his relationship with Jo. He essentially said that Jo used to be a drunk, was flat-out crazy, and made up anything she said about him. However, his mistake was saying that whatever she said about him was false. How would he know what Meredith knows about him? Meredith didn’t say a word about what she knew about Jo’s past, so for anyone that was questioning whether Paul or Jo was the real monster, this was the dead giveaway. Later on in the episode, we learn that Jo is still afraid to even be near Paul. Meredith goes with her to a conference room to meet Paul and sign the divorce papers. Jo flinches every time that Paul even moves slightly toward her, which is another sign that the worst did happen to Jo. We don’t know everything that happened to Jo, but she paints a clearer picture toward the end of the episode. With such a heavy and timely storyline, it is hard to find something to feel good about within it. But the acts of solidarity the characters showed Jo throughout this episode were fantastic. To see both Alex and Meredith immediately drop everything to protect her was a testament not only to how much Jo means to them, but also how much they believe her. While they acted more like her overprotective parents in the scene where the three of them were in the operating room gallery, it was sweet to see everything they did to stop Paul from getting any alone time with Jo. Also, seeing the interns and then Arizona blindly help Jo without knowing anything about her situation was extra special. Jo’s storyline truly reflects the changing times the country is currently facing regarding domestic and sexual abuse. Seeing the outpouring support from her coworkers, including some who didn’t know about the situation, was a great way to tell audiences that we all need to see victims and support them. An even bigger testament to how well the theme of the episode was dispayed is when Jo uses Arizona to distract Paul so she can have a quick conversation with Jenny. Jo tries to get Jenny to tell her whether Paul is still abusive or not. While Jenny doesn’t say anything, her body language conveys a different story. Jo decides to tell an awful anecdote about Paul’s jealousy, anger, and abuse to let Jenny know that she shouldn’t be afraid to leave him. Jo goes so far as to offer Jenny her number so she can get Jo’s help getting away from Paul anytime. It’s great to see Jo trying to help another potential victim. And while we don’t know the specifics of how, Paul figured out that he was being tricked and made Jenny confess that she talked to Jo. Paul hunts down Jo, who is in a lounge with Meredith, and threatens her. He also says that he now knows where she is, can stalk her, and will hold onto her phone number just to torture her. Meredith gets Paul to leave by fake calling (since the phones are still down) security. But Paul will be back for this story to come to a head in the next episode, where he is the victim of a hit-and-run. Other than a powerful domestic abuse storyline, the midseason premiere featured a few other plotlines that will definitely play out over the rest of the season. While the temperature in the hospital was literally increasing due to the hackers, romance is also heating up. Jackson and Maggie share quite a few awkward and revealing moments, and they honestly need to just get a room and figure themselves out already. Though Jackson finally makes a move at the end, Maggie has come to the conclusion that they have a complicated relationship, considering that they are technically step-siblings. After several months of pining over Jackson, Maggie suddenly has a problem when he asks her out for a drink?! It would be weird for them to never get together at this point, so I’m still betting on it working out. Andrew and his ex, new intern Sam, are also in a rough place. After being caught together in a closet in the winter finale, Sam has decided that she can’t keep having relations with Andrew anymore. Richard keeps trying to push them together though, and it’s only a matter of time before they wind up in the same place again. While their past has yet to be fully told, I bet their future holds a lot of hot and heavy action. Lastly, two of the other interns play a big role in the episode. Schmitt saves his and Meredith’s patient in the operating room by giving his blood to her. The patient later deems him her hero, even though he practically threw up in her open abdominal cavity. Casey is the bigger hero, as he winds up saving the day by stopping the hackers. After revealing to Bailey that he once hacked a federal server, Casey uses several techniques to find the hackers via their IP address and force them out of Grey Sloan’s systems. He then drops the bombshell — he hacked a DMV server because they refused to change his gender on his license from female to male. Casey becomes the first major transgender character on Grey’s Anatomy, which should lead to some more great storylines down the road. However, I was surprised that he mentioned this so quickly, as if in passing. It will be interesting to see how some of these interns continue to impact the larger stories in the remainder of the season.